Bizible unifies user behavior and advertising data with sales outcomes, allowing you to control the success of your marketing investment. The CallTrackingMetrics integration with Bizible works by capturing the Bizible cookie value in the tracking code, storing it in a custom field, and sending that custom field to any CRM using a webhook. You should discuss the integration with your Bizible account manager to ensure you have the necessary activity fields created in your CRM. If you wish to use Bizible with Salesforce, you must set up the Salesforce integration with your CTM account. Update your Salesforce mapping (if using Salesforce). The field needed for the integration can be added in either the Contact section or the Score section of the call log. Click Add Field in either section. Enter Bizible Cookie as the name of the field. The default option for the type drop-down will be Text. Do not change this setting. Use the drop-down menu on the right side to select Save to Activity. See this article for more information on custom fields. Navigate to Numbers → Tracking Code. Enter a name for your trigger that you will easily recognize. In the Trigger drop-down menu, select When a website session is associated to the call record. Choose which numbers you want to associate with the integration. If you want to use this integration with all numbers in your account, select the Trigger for all Activities toggle to turn it on. If you want only certain numbers to work with this integration, leave the toggle off. After you have saved the trigger, click Edit Assigned Tracking Numbers to choose which numbers will work with the integration. In the Workflow panel that appears, click the trash can icon on the right side of the default rule to remove it. Click Add Action at the bottom of the Workflow panel and select Update Field. Use the drop-down menu to select the Bizible Cookie custom field. In the field to the right, enter bizible. 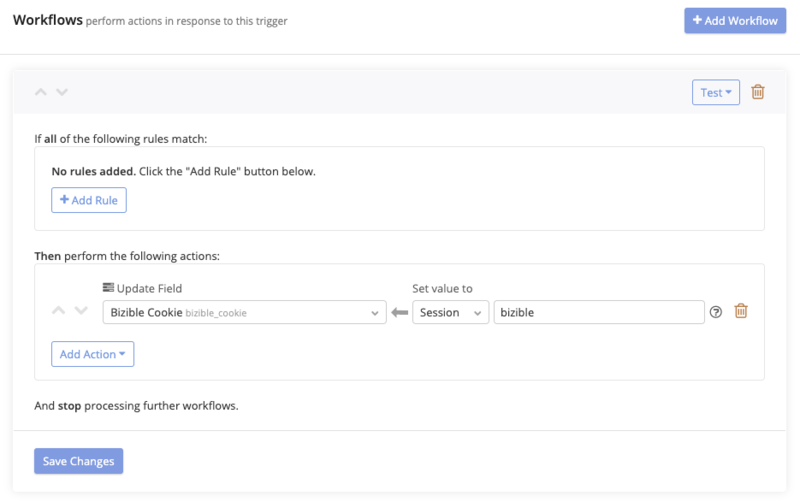 In your Salesforce integration settings, you will now be able to map the “Bizible Cookie” into the bizible2_BizibleId__c field in the Salesforce Activity record. If you do not see this field, see your Bizible Success Manager to get the latest version of the Bizible package.